A traditional veggie dish from the island of Crete, perfect for a light dinner! The secret behind the perfect Ntakos is to use juicy, fresh, organic, on the vine tomatos as they are the key ingredient that brings this dish to life. 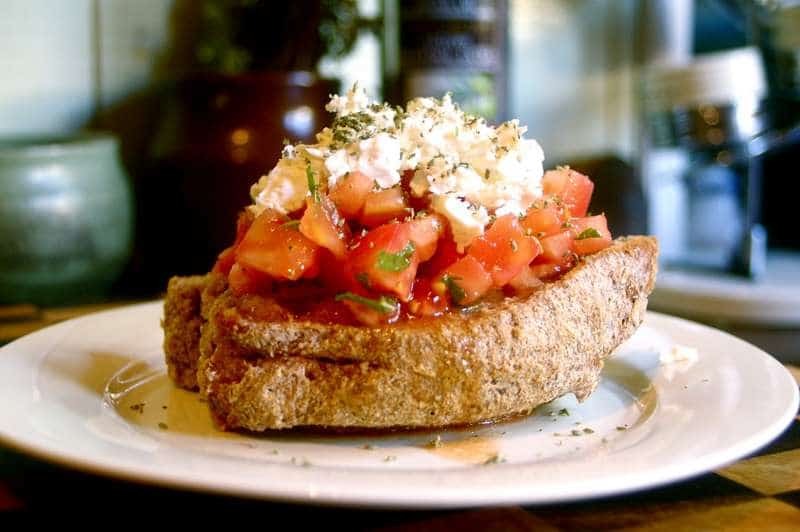 Garnishing with extra virgin, good quality olive oil will give the perfect finishing touch to this traditional Cretan rusks with tomatoes and feta cheese dish. Moisten the rusks ( paximadia ), with 4 tbsps of water each, and drizzle with the olive oil. Crumble the feta cheese and myzithra (soft cheese) with a fork, or grate it with a grater.